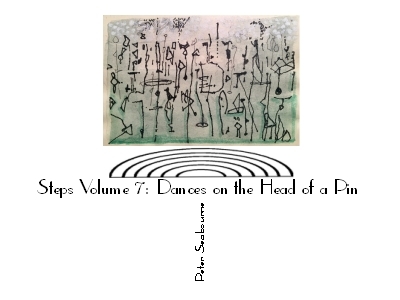 Completed Steps Volume 7 - Dances on the Head of a Pin. Work already begun on Steps 8 but other projects to attend to first. 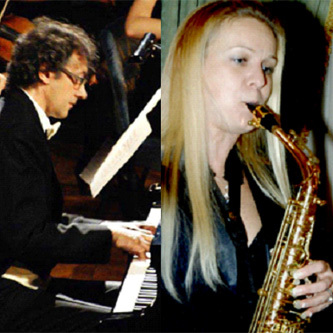 Da Vinci label will release a CD by friends Valentina Renesto and Giuseppe Bruno. This includes a transcription they requested of my song cycle The Garden in the Brain for alto saxophone and piano. Completed the 3rd PIano Concerto - a long gestation of 18 months. I hope this does not , like its predecessor, sit for 11 years unwanted. 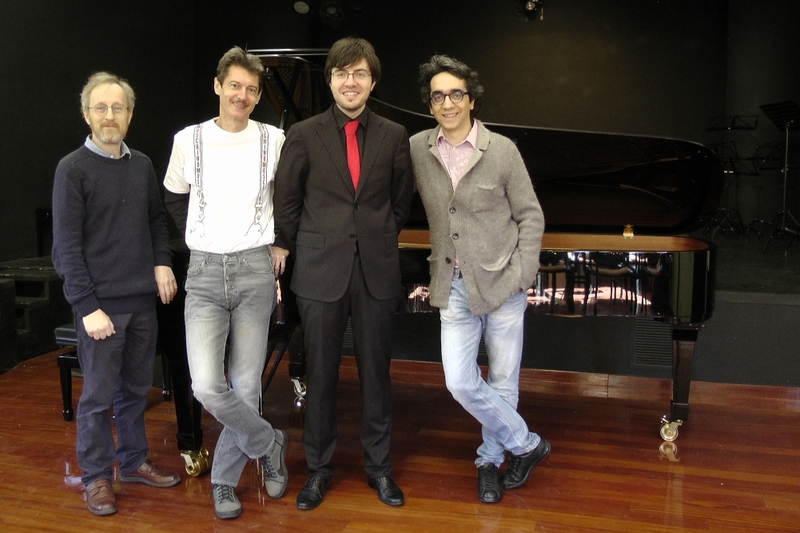 Completed my Piano Trio for my young friends, Avant Trio - Rebecca Raimondi, Urška Horvat and Alessandro Viale. A substabtial four movement work lasting some 24 minutes. Finally a completed work among all the recordings. This is The Black Pegasus, a rhapsody for horn and piano dedicated to my dear friend and champion and champion, Ondřej Vrabec of the Czech Philharmonic. It is possible a premiere will take place in Osaka in July 2018 (tbc). Taking its starting point from the Redon painting it alternates strident, driving, galloping music with moments of heightened lyriscm and passion. An extended article in International Piano magazine focussing on a movement from Steps Volume 3: Arabesques: Daybreak - Generalife Gardens. Kind friends Lydia Artymiw, Barbara Nissman and Michael Bell all contributed performance notes to guide players in interpretation. Much of the last year has been taken up with recording projects for my label Sheva Contemporary (a sub-label of Sheva Collection). 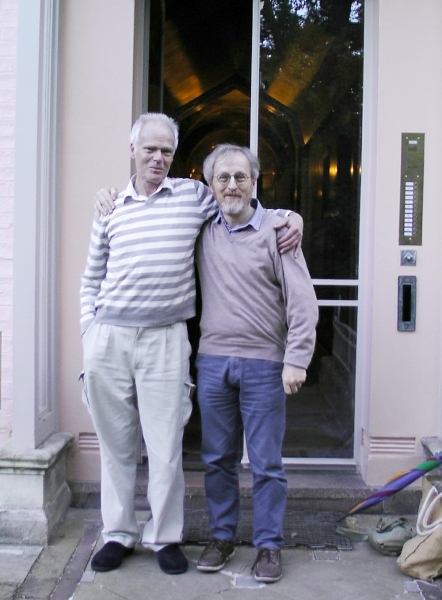 Among these I have been especially proud to promote the work of two friends, David Collins, and my old teacher Robin Holloway who is 75 this year. Both are very gifted, but woefully under-recorded. 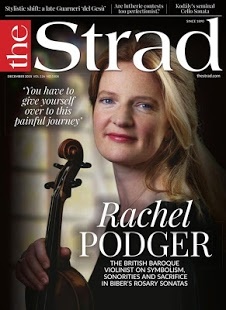 Click on the pictures if you want to buy (takes you to Presto Classical - worldwide shipping). A joy to work with talented young musicians Rebecca Raimondi, Alessandro Viale, Rees Webster, Oliver Pashley and Henrietta Hill. 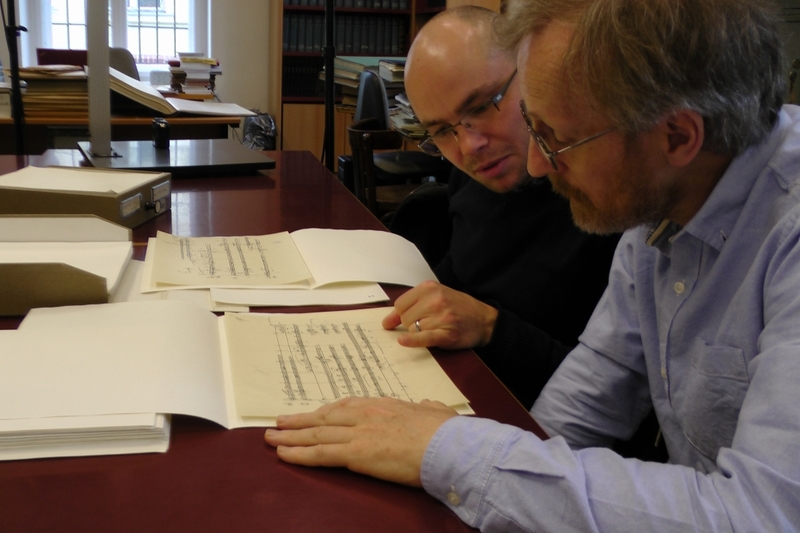 And all under the expert guidance of the two composers and Spencer Cozens of Steinway Recording. 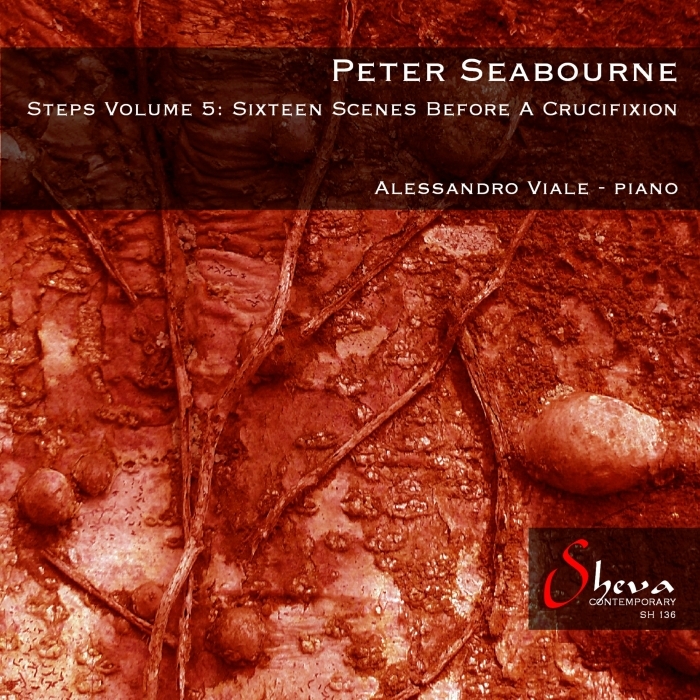 A five star review in Musical Opinion for Alessandro Viale's CD of my Steps Volume 5: Sixteen Scenes Before a Crucifixion. Richly deserved, Alessandro! 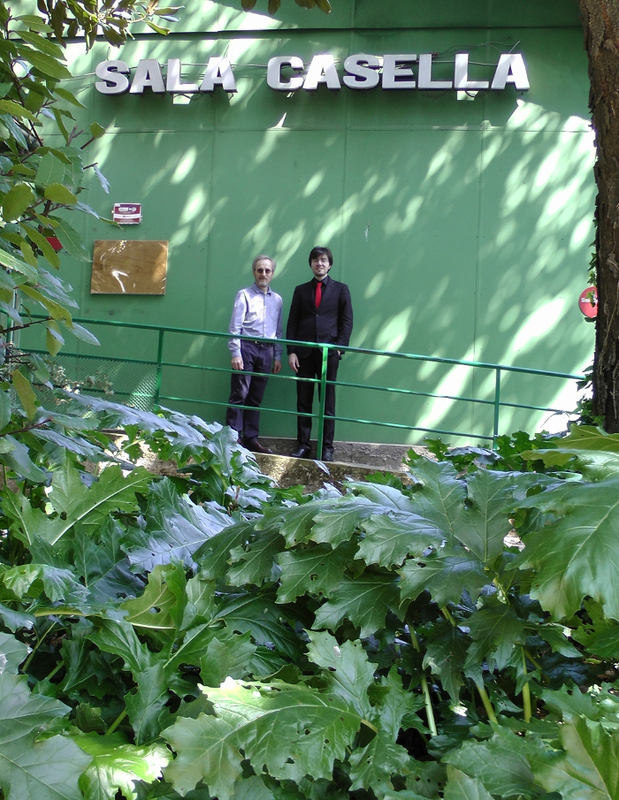 My great friend and now frequent collaborator, Alessandro Viale, kindly included two movements from my Steps Volume 3 in his recital at the Salla Casella at the famous Filarmonica Romana (where two years ago he also recded my Steps Volume 5). Long time friend and champion Michael Bell gave a stunning performance of Steps Volume 3: Arabesques in Keele University Chapel. As with the Leeds premiere four years ago there was a simultaneous slideshow of the related Alhambra paintings by my aunt Ann Seabourne. 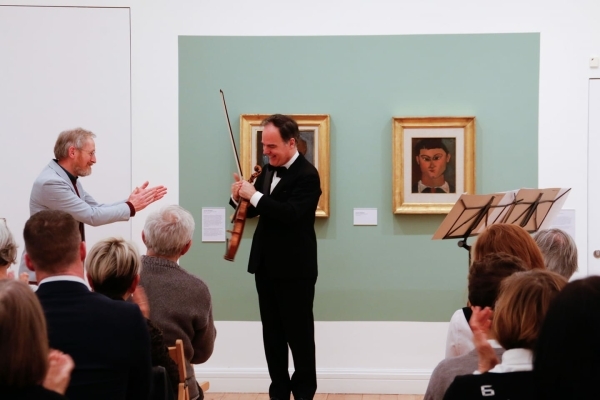 A wonderful performance by Alberto Bologni of my Threads at The Estorick Collection in London (gallery devoted to Modern Italian Art), a work jointly dedicated to him and Litsa Tunnah. 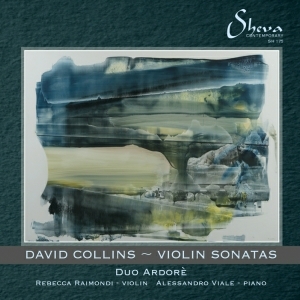 There is now also a superb CD on Sheva Contemporary. Found on Amazon, Presto Classical and many other sites. 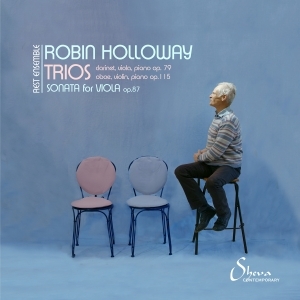 I was asked to write an article for Musical Opinion magazine on my teacher from 30 years back, Robin Holloway, who is 75 this year. 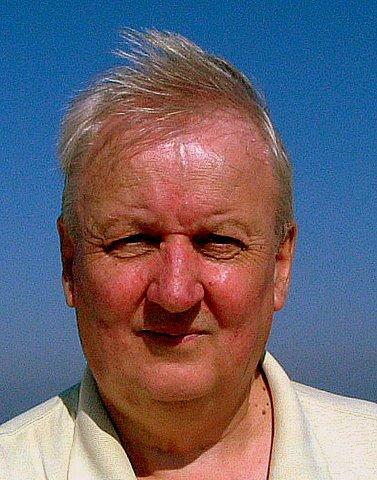 What a great honour and pleasure to review an extraordinary life and incredibly varied output. 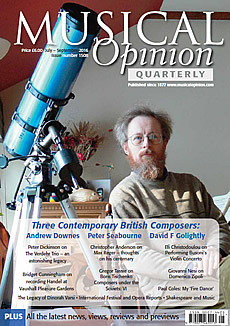 Not only is Robin a great composer with a distinctive personal soundscape but he has also been a noteworthy writer about music (including 22 years at The Spectator, and with three published book), teacher of many great names, and above all a kind, cultured and endlessly curious human being. Icing on the cake that the article was chosen as the cover story! 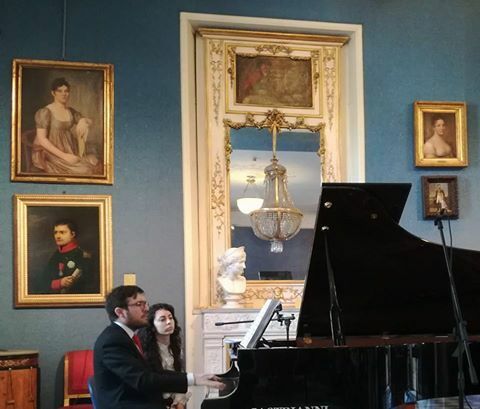 Friends Henrietta Hill and Alessandro Viale gave the Italian premiere of my Pietà for viola and piano at the Museo Napoleonico in Rome. This huge work, virtually a symphony in miniature, was written as an in memoriam to my parents is obviously close to my heart. 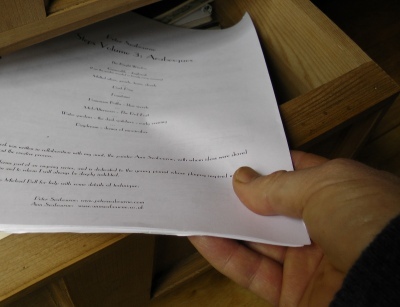 Steps Volume 6: Toccatas and Fantasias is completed for my dear friend Konstantin Lifschitz. It was requested as a piece to partner the toccatas of J.S. Bach. 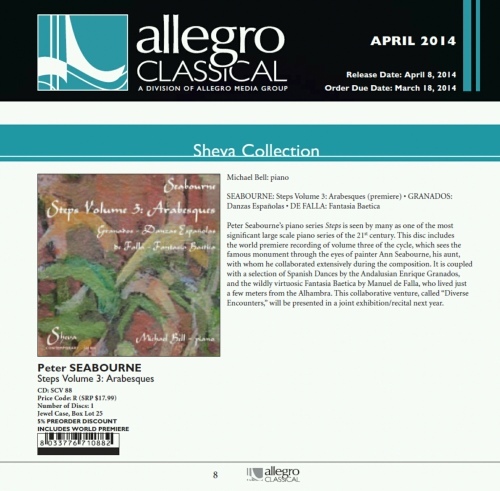 Exploring the Musical World of Peter Seabourne "one of the most masterful and interesting String Quintets I’ve ever heard in my life"
The two joint dedicatees of my Threads for solo violin, Alberto Bologni and Litsa Tunnah, gave the first Italian and English performances - each very beautiful, each quite individually charachetrised and distinct. Alberto has since recorded the work for Sheva Contemporary label. Another positive review in Gramophone. This is the fourth time Gramophone have reviewed my Steps series. This time Richard Whitehouse covers Steps Volumes 1 and 5. 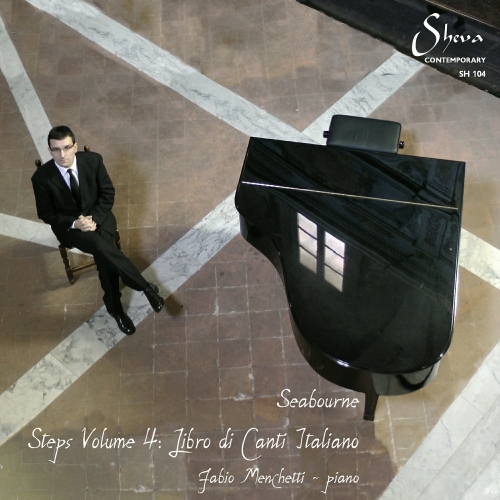 "Those who have been collecting this series need not hesitate"
The premiere of Steps Volume 5 at the Museo Napoleonico in Rome by Alessandro Viale was a great success! It was included in a news report on local television. 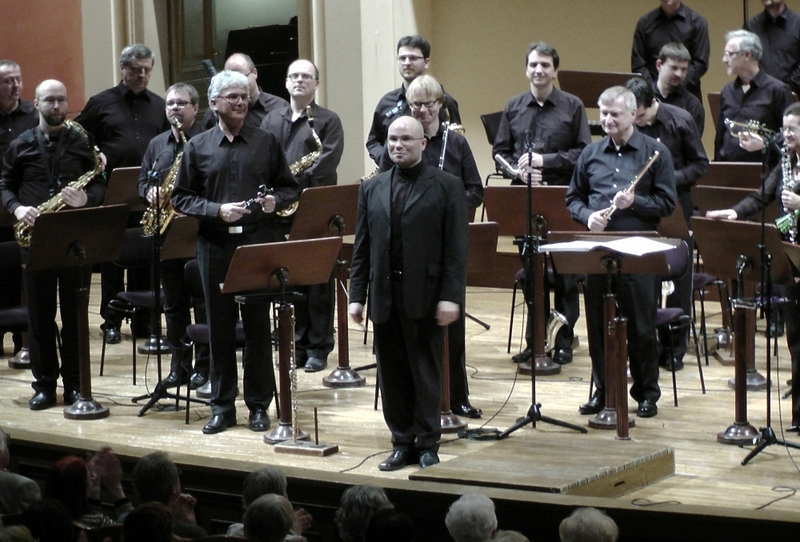 One audience member likened the experience to the journey of Bach's St John Passion. Most flattering. My Steps volumes have had many reviews but this is the first of the whole series in the German magazine Piano News. "Only rarely have we had from a modern composer a world of piano music which is so cohesive to the ear, and pursued with such consistency. 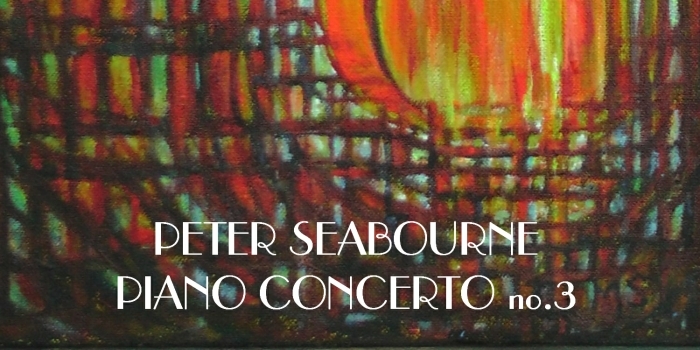 At all events, Seabourne's piano music is worth hearing and to be recommended!" Another very positive review of the CD VIOLA DOLOROSA containing my work Pieta by blogger-reviewer Robert Hughill. 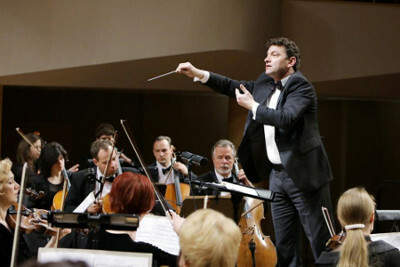 "Pieta is remarkable for the concentrated intensity of the music over such a large scale"
The 4th Symphony is complete. Almost identical in length to the 3rd. 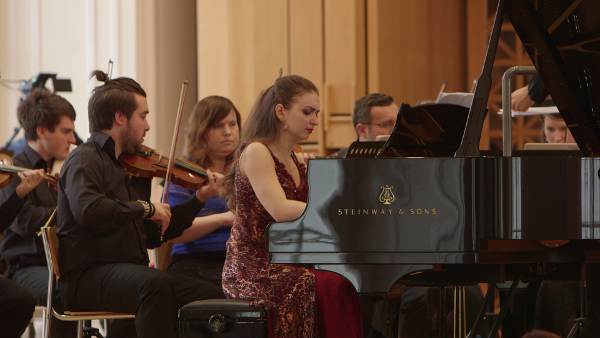 Next comes a piano cycle, Steps Volume 6, for Konstantin Lifschitz to record along with the Bach Toccatas. My pieces will have a similar sectional, virtuosic feel. 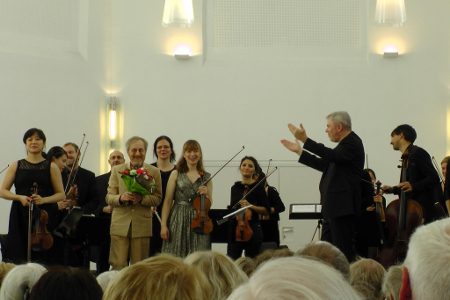 A very nice review of my Violin Concerto by Bruce Reader on his site The Classical Reviewer. 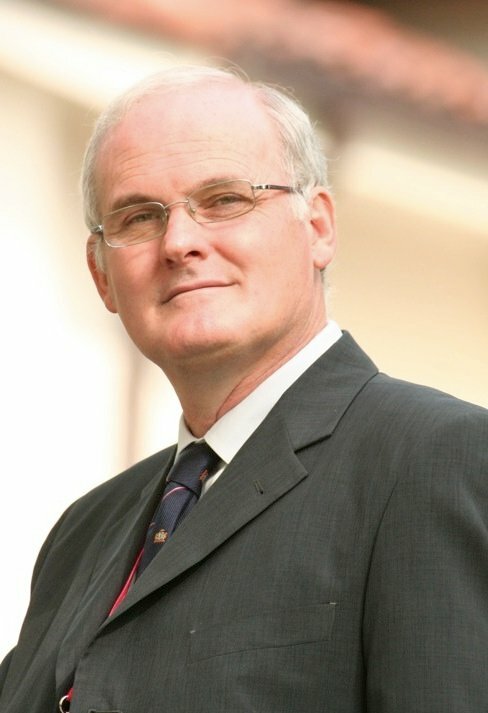 I am grateful to have such a warm advocate, and one who writes in detail and with understanding. A wonderful trip to Germany to work with Fenella Humphreys, Lavard Skou Larsen and the Deutsche Kammerakademie Neuss Am Rhein. This was for the premiere of my Violin Concerto. This comprised the earlier This is a song for you alone and a newly commissioned partner piece called Give to Me Another Song. I have since accepted the inevtiable and called the combined work simply Violin Concerto. The reception was incredible! 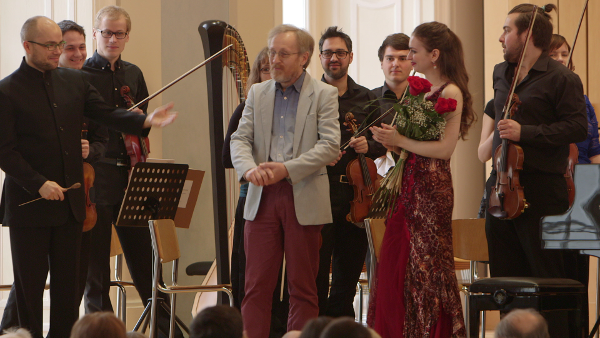 My Symphony of Roses was broadcast again in Switzerland, and also in Estonia and Portugal. 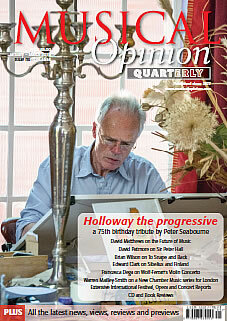 Musical Opinion kindly promoted me to its front cover this month. 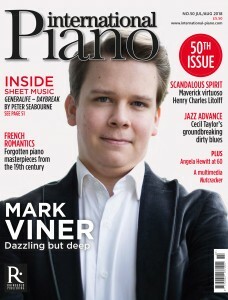 Critic Richard Whitehouse, who has previously reviewed my CDs for Gramophone Magazine, writes a very positive, detailed article. 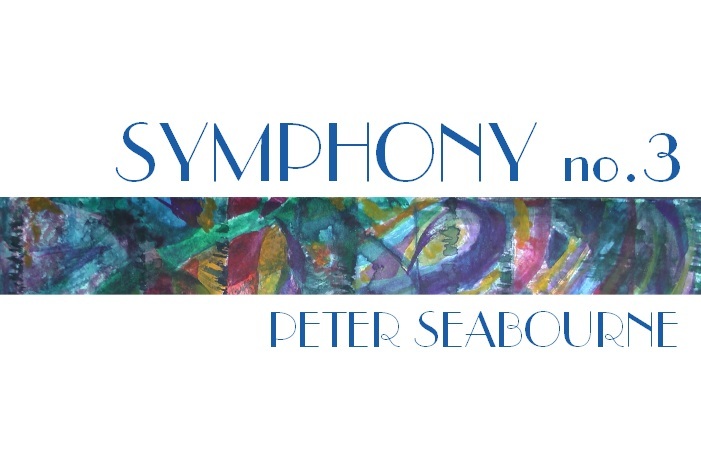 "Ambitious, questing and pointedly European in outlook, the music of Peter Seabourne avoids easy answers." 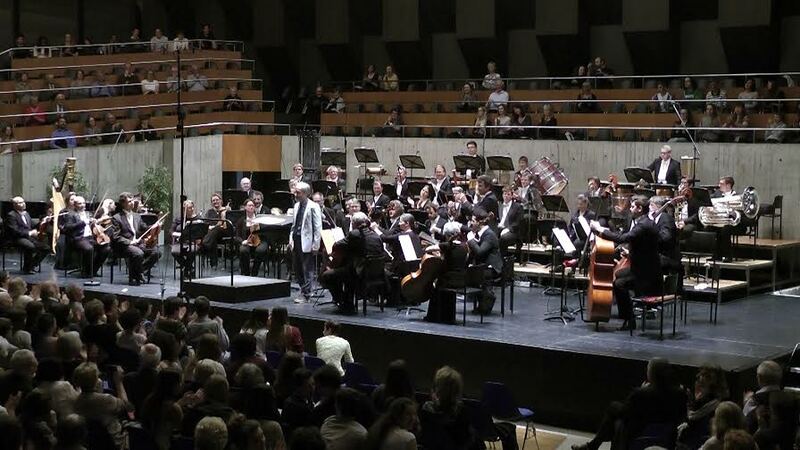 A wonderful premiere of my Symphony of Roses in Switzerland by the Symphony Orchestra of Biel-Solothurn under my dear friend Kaspar Zehnder. Such enthusiastic reception from both orchestra and audience (called back four times - certainly a record!). 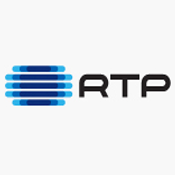 It was broadcast on SRF2 Kultur in Switzerland. You can watch the second movement, "The Rose of Peace" below. I am hopeful that the orchestra might allow me use of the full video before too long. An extended interview with my dear friend, the founder of Sheva Collection CD label, Ermanno De Stafani for his magazine Encounters - click here. 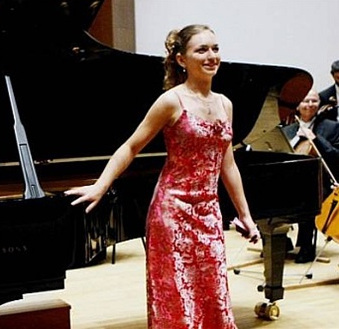 Outstanding performance of my Piano Concerto no.2 by Kristina Stepasjuková, with the Czech Philharmonic Academy Orchestra conducted by dear friend and champion Ondřej Vrabec. 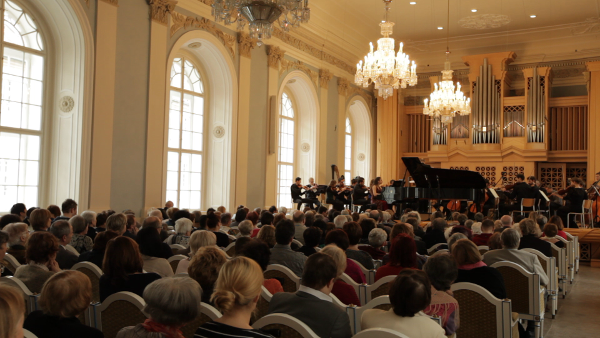 It took place in a packed hall at the Lichtenstein Palace in Prague. I have waited many years to hear this work and was pleased (despite a little trepidation) to find it a powerful span of music. It is hoped that we can repeat the performance elsewhere before long. There will be a recording and video on this site soon. 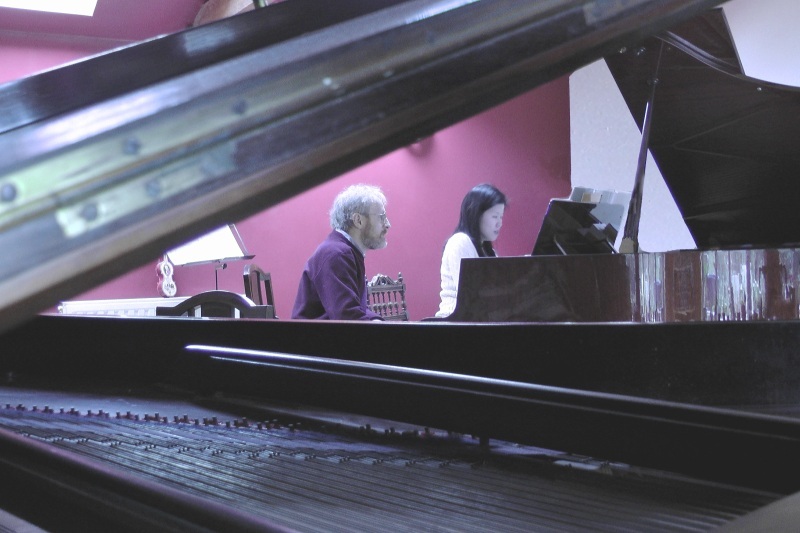 "...all the works in the volumes are extremely varied and idiosyncratic, with much rhythmic and melodic interest, often very lyrical though not necessarily “tuneful”. 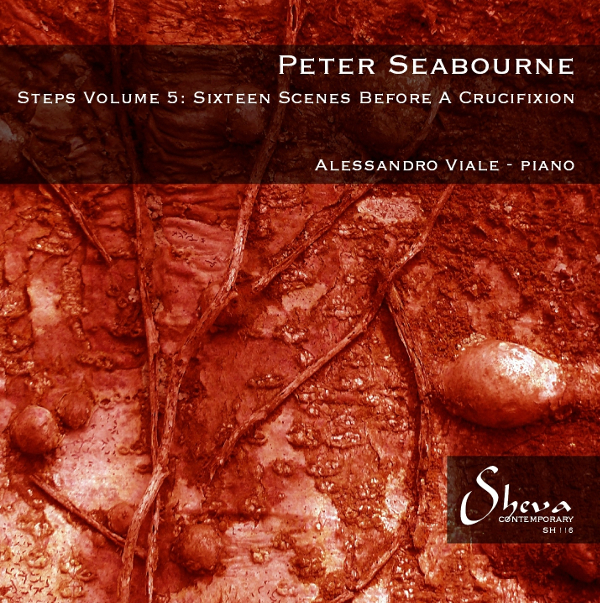 Seabourne employs a colourful and piquant harmonic palette which recalls Debussy, Janacek and Messiaen, while the rhythmic vitality of the music is akin to Prokofiev; indeed the brevity and aphoristic nature of the pieces aligns them with Prokofiev’s ‘Visions Fugitives’ and ‘Sarcasms’. 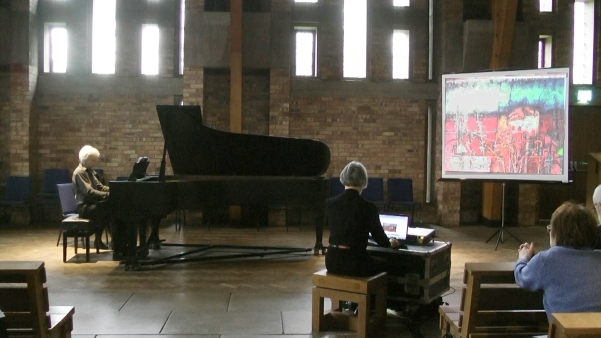 The works are challenging, and probably best tackled by the advanced pianist who enjoys such technical challenges as varied time signatures, polyrhythms, myriad articulation, filigree textures and one with the requisite artistic sensitivity and imagination to bring musical colour and invention to the music. 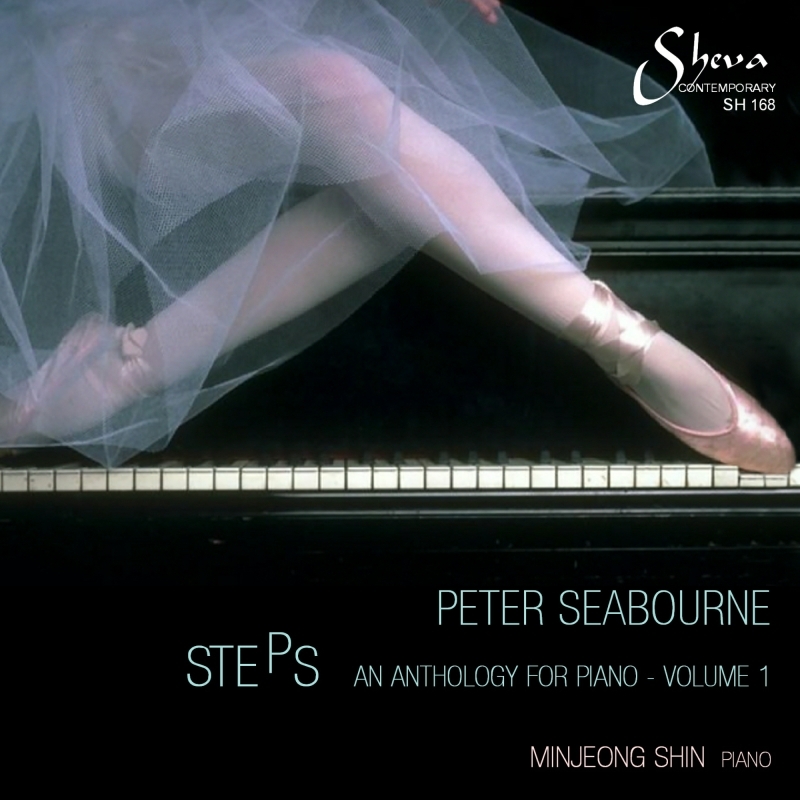 It is always gratifying to find new music for the piano, and Steps is undoubtedly an important addition to the repertoire and definitely worth seeking out." 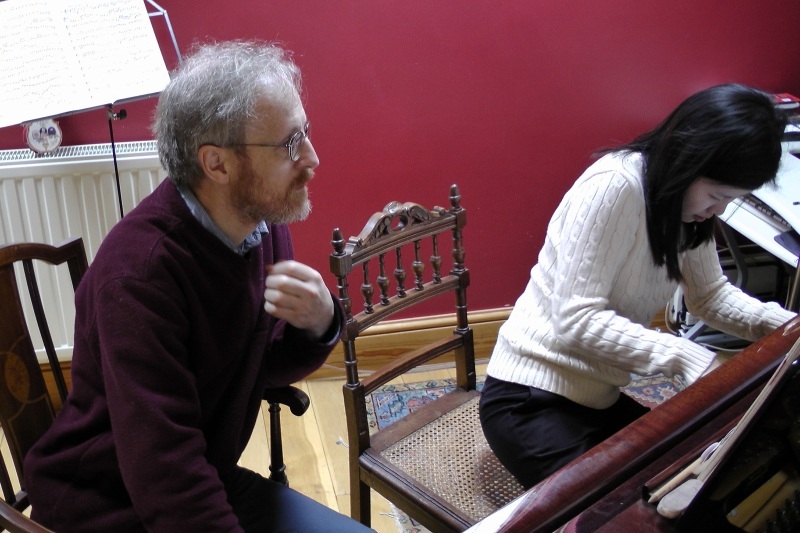 Working at home with Minjeong Shin on Steps Volume 1 which will be recorded in August. 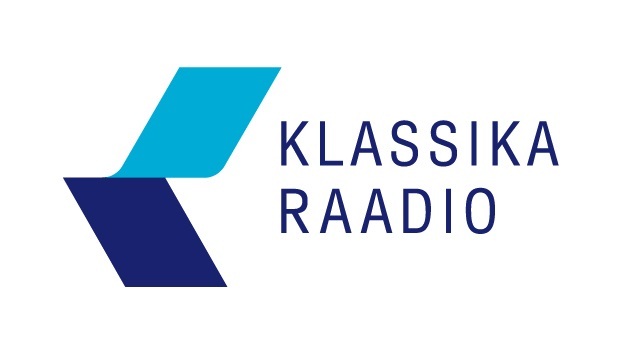 I have been commissioned by Deutsche Kammerakademie Neuss am Rhein to write a new single movement romanza for violin and string orchestra to be played as a pair with This is a song for you alone (or indeed separately). It will be a 6-9 minute work with a première in November 2016. The soloist is Fenella Humphreys and conductor Lavard Skou Larsen. 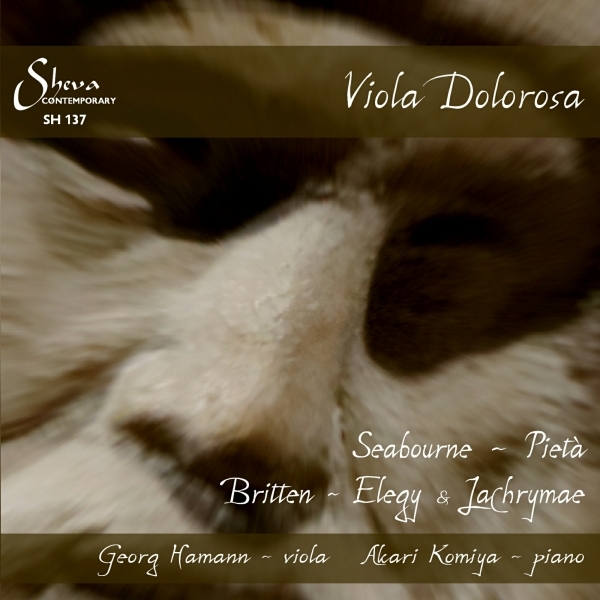 Another nice review of VIOLA DOLOROSA CD which includes my viola and piano work Pietà. This time in The Strad by Carlos María Solare. 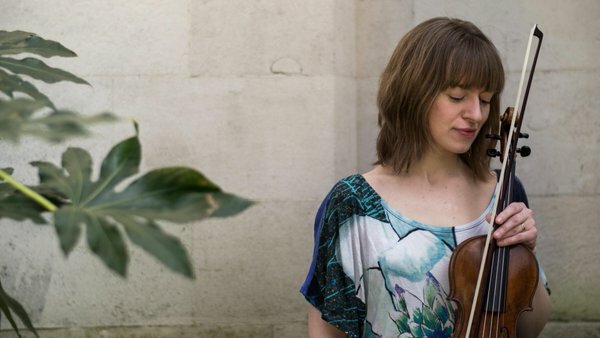 "A finely wrought new addition to the viola and piano repertoire"
Next year sees two premières (possibly another two, also, but news of these must wait a little longer...)! Thank you to these two dear, talented friends! I am so looking forward to working with you both again, and to a new collaboration with Kristina! Two wonderful reviews by Bruce Reader of CDs containing my work are now found on his excellent site The Classical Reviewer. If you want good, detailed, perceptive and honest writing I recommend this site more than any other. He not only listens, but does so in depth. His reviews do not trot out a few "clever remarks" designed to impress, adhere to bland desctiptions, or indeed indulge in a "throw-away" knifing. They are both informative and illuminating. 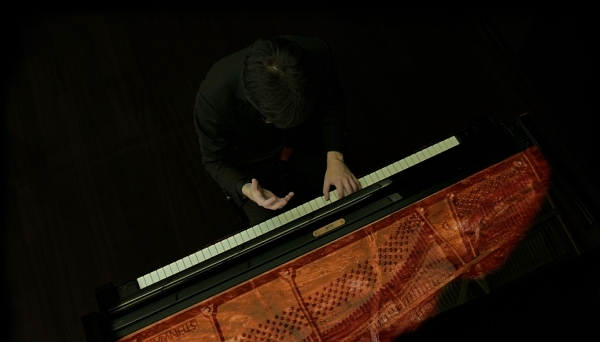 "Pianist, Alessandro Viale shows consummate skill whilst never losing sight of the inner voice that runs through Peter Seabourne’s compelling piano work, Steps Volume 5: Sixteen Scenes before a Crucifixion, a new release from Sheva Contemporary"
"Peter Seabourne’s Pietà, recently released by Sheva Contemporary, is a powerful work that casts a real spell over the listener revealing him to be a composer of immense emotional clout." This disc was also reviewed (in a rather strange way) by BBC Music Magazine. 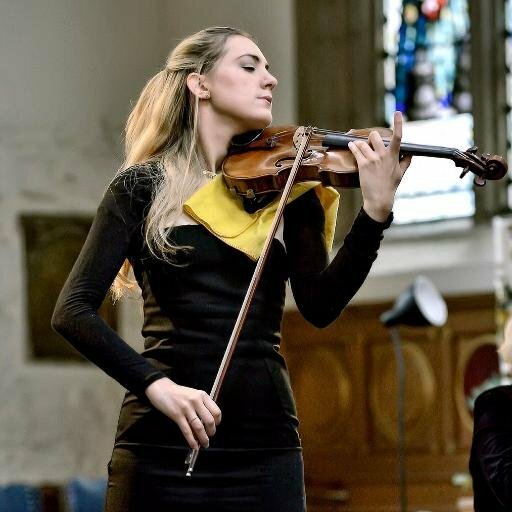 "Seabourne's expressive and accessible score chimes well with Britten;s lyrical works, and the rich tonal palette of Hamann's playing is beautifully showcased in the work's demanding viola line." 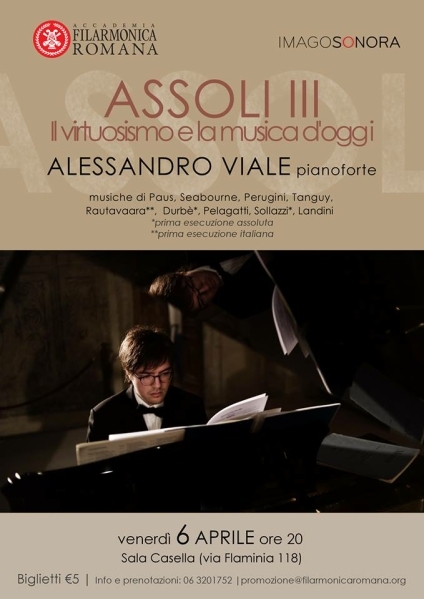 Alessandro Viale will give the premiere of Steps Volume 5 at the Filarmonica Romana (Rome) this autumn. 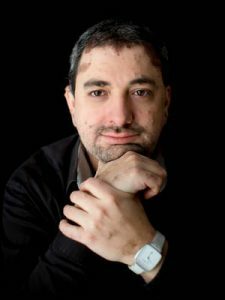 My deep thanks to Domenico Turi, Assistant Artistic Director! This movement (9) is demonic, brooding, perhaps even at times brutal. 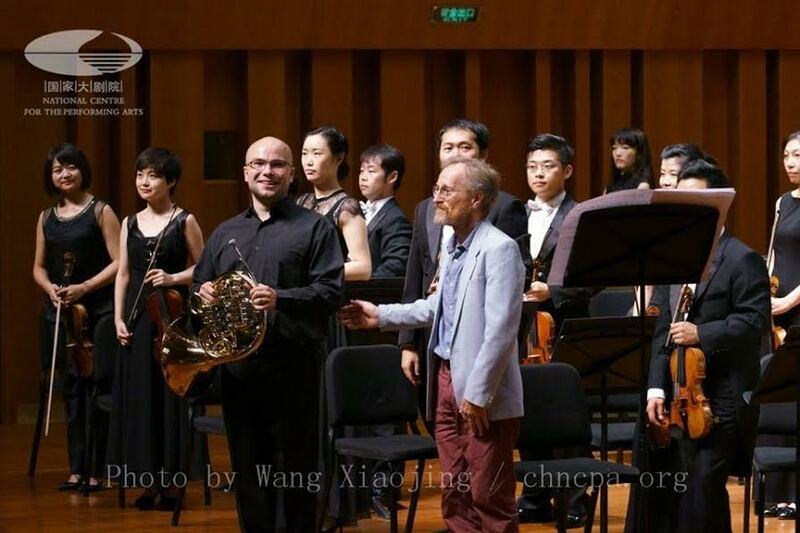 Chinese premiere of the Double Concerto for Horn and Orchestra was on 7th August. 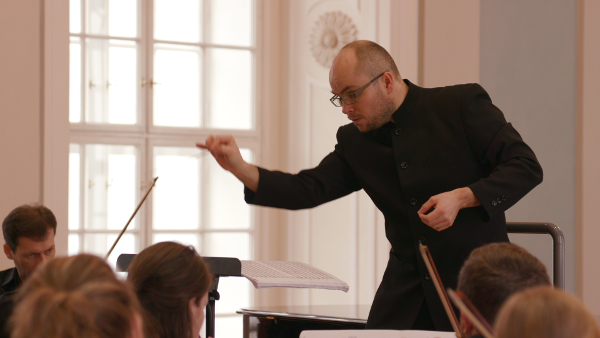 Soloist is my dear, dear friend and champion Ondrej Vrabec, solo horn and assistant conductor of the Czech Phil, wtih whom I am truly delighted to work again! The conductor was the outstanding Lyu Jia - a real pleasure to work with him and his excellent NCPA Orchestra. Details of the Beijing performance are here. I am currently working on my 3rd Symphony. The first movement is complete along with a good portion of another, a funeral march. 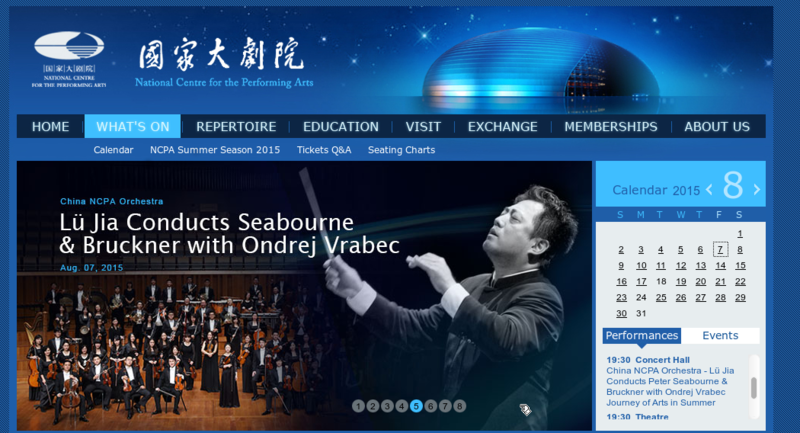 I have heard that in August 2016 Ondrej Vrabec will give a performance of my Double Concerto for Horn and Orchestra in the National Centre for Performance Arts in Beijing. 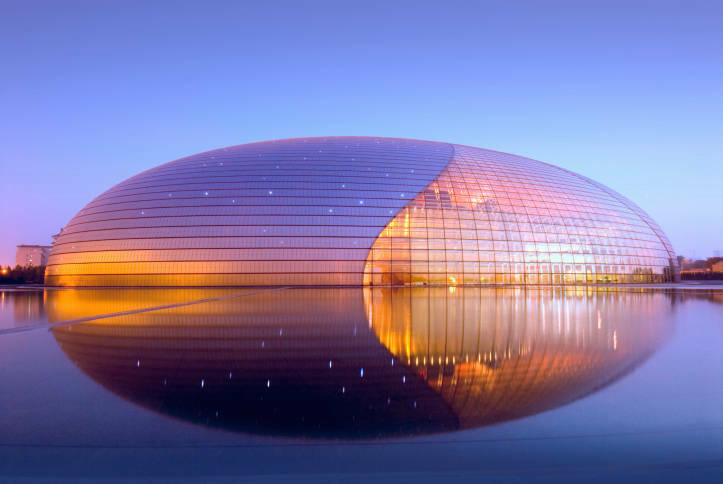 This is arguably China's most important concert hall, so quite an honour! A busy Easter "holiday". 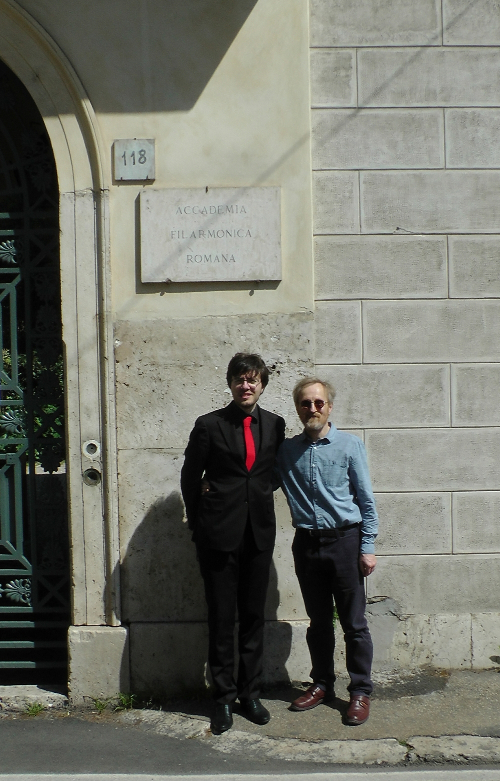 With pianist Alessandro Viale we have recorded my Steps Volume 5 Sixteen Scenes before a Crucifixion in Rome's famous Accademia Filharmonica Romana. 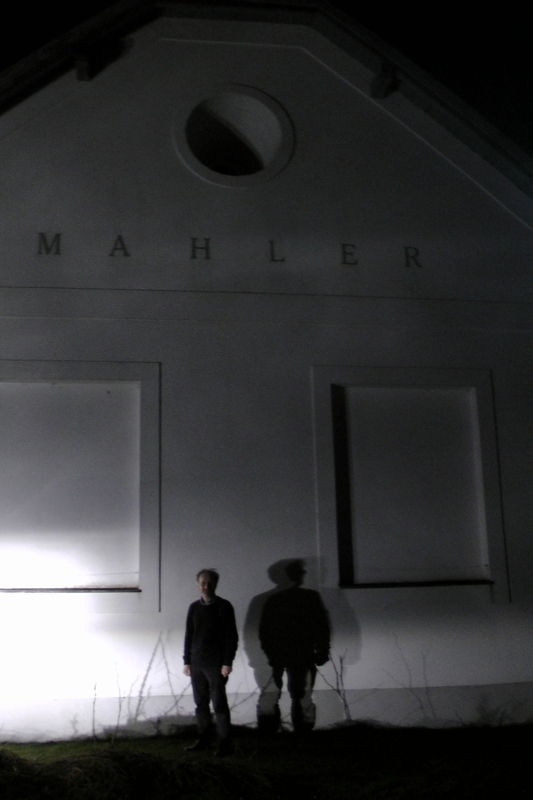 The CD will be released in the summer on Sheva label in Italy. Like proverbial number 10 buses, I wait until my 54th year and then suddenly two symphonies come along at once... Actually this one has been maturing slowly, being composed alongside its earlier sibling. I have been most productive in recent months - all at once this big brother seems to be complete, my "pen" flying along as it did when I first started up again in 2014, the music writing itself. 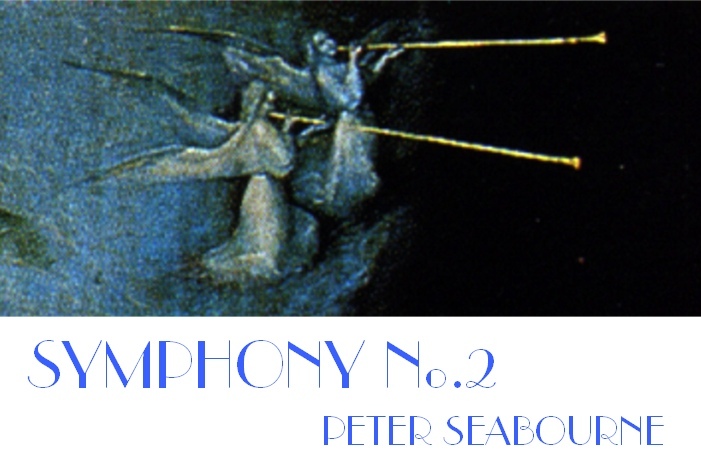 Symphony no.2 is more abstract, but I'm rarely without influences and stimuli - this substabtial 45 minute, five-movement work is inspried by Bosch's angel trumpetters in his Last Judgement, and his Ascent into the Empyrean. It has prominent parts for two trumpets, which gradually move off stage. 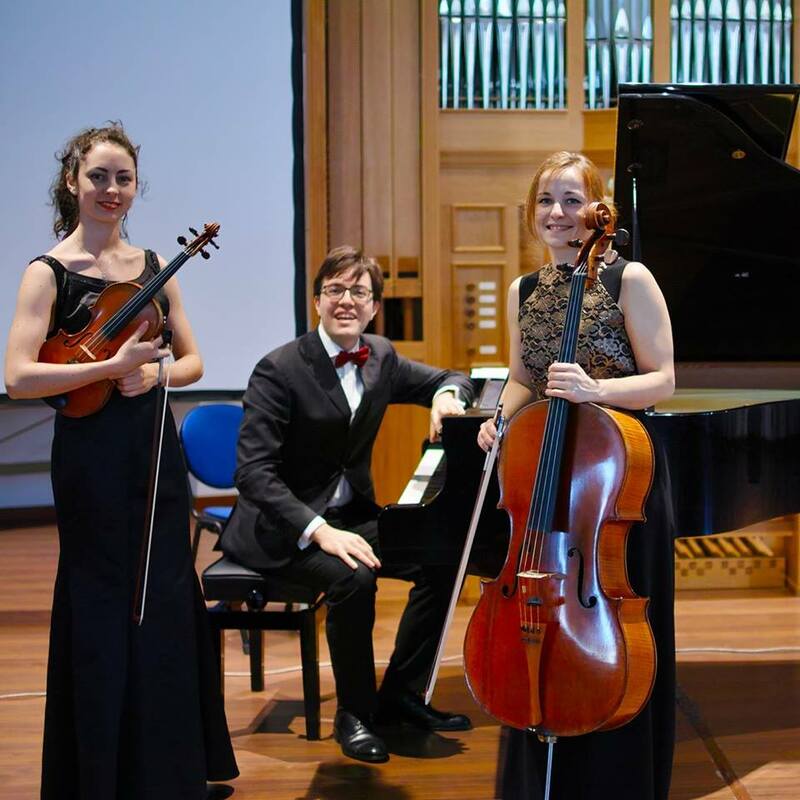 Bethel Balge has just kindly performed three of my Steps 2 movements in a doctoral recital in Minnesota, USA. 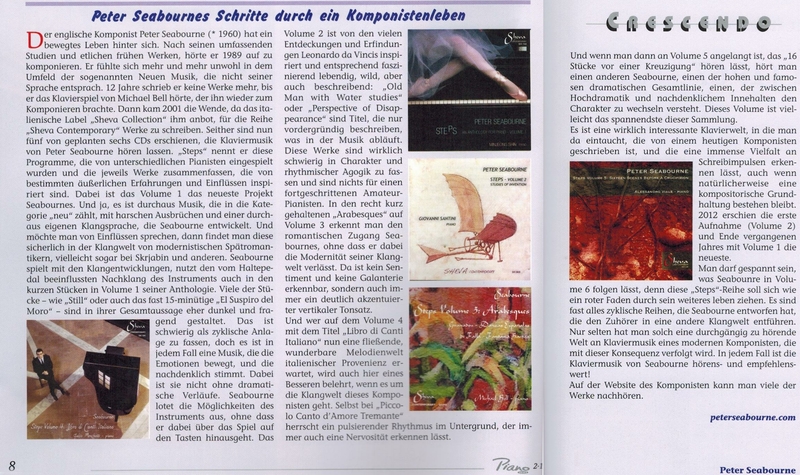 A nice review in Gramophone Magazine of my Steps 4: Libro di Canti Italiano by Fabio Menchetti. You can read it here. This is the third time a CD of mine has appeared. 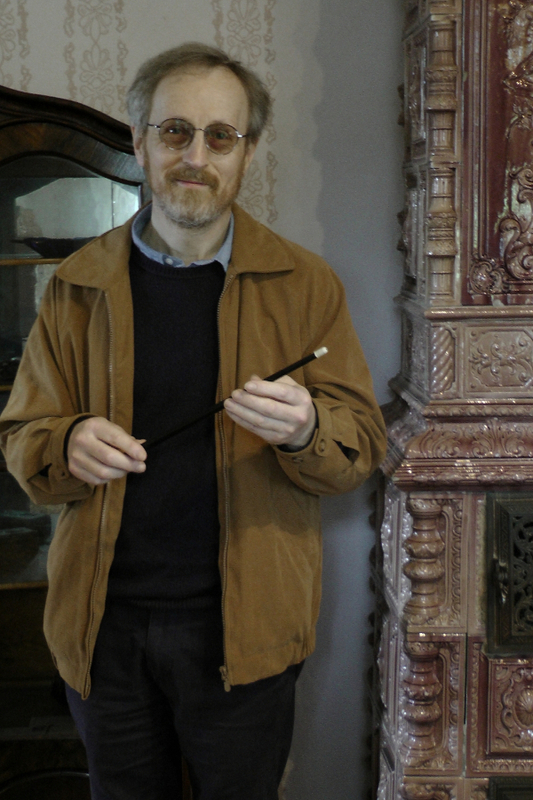 Please do visit the website of Sheva Collection, owned by my dear friend Ermanno De Stefani - www.shevacollection.it . This innovative Italian label now has five CDs of my work, and there are more planned (indeed one is already partly recorded). 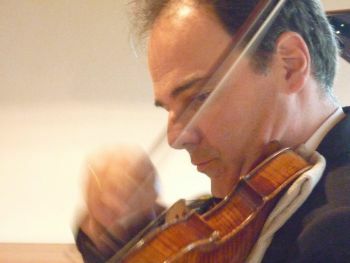 Ermanno has amassed a large catalogue of very interesting repertoire, including many premiere recordings, and rarely performed works. 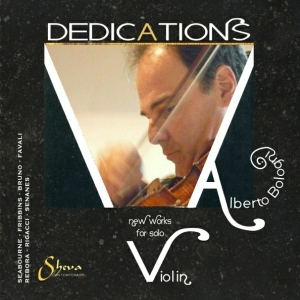 His Stanford complete violin music triple CDs won many plaudits recently. Sheva CDs can be found widely on the internet from the usual big stores, but also the excellent Discovery Records in my home town of Devizes. 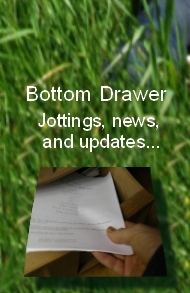 They are also available as digital downloads from the usual sources. If you are an artist thinking of making a recording, do get in touch with Ermanno who has developed one of the least expensive ways to help you reach a large audience. 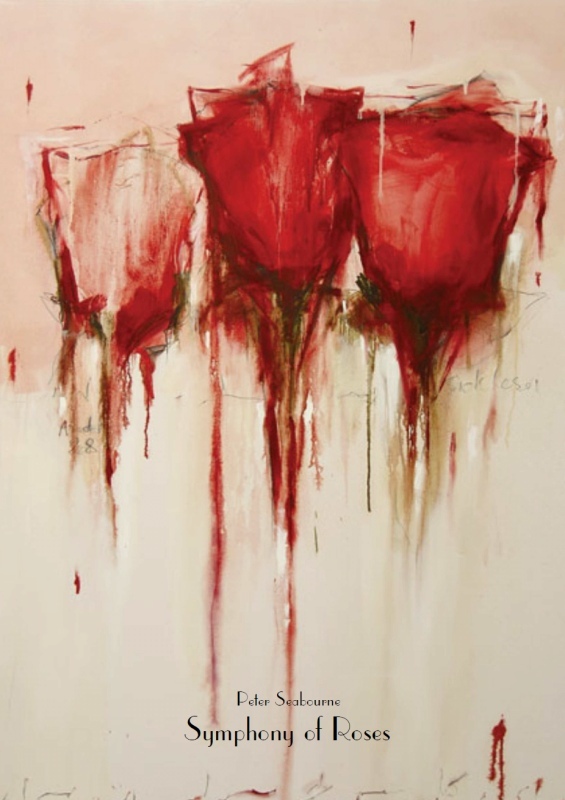 ...I seem to have finished a symphony (Symphony of Roses), but there is the possibility that this might be commissioned so for the time being it will not appear here. Inspiration came from two W B Yeats poems and a J B Yeats (brother) painting. (The cover design is by Azadeh Razagdoost, artist friend from Tehran). 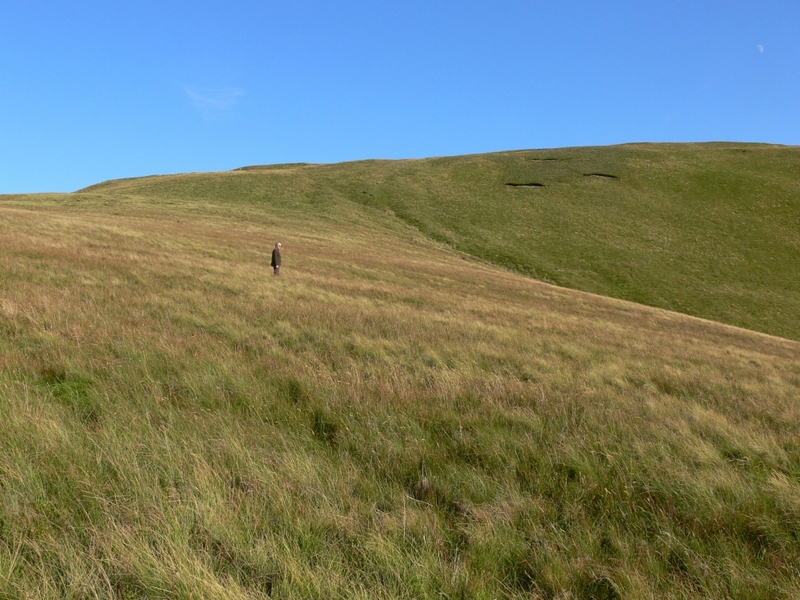 All my life I have yearned for quietness and the freedom to roam - in part, this is the product of growing up on a farm, where as a child I could just wander off and disappear into my own landscape, both real and imagined, and be unaccountable. Every summer since I have (in vain) sought to return to this world that was so precious to me - one holiday house after another, despite promising assurances of isolation and peace, turning out not to be it.. - always noise follows me like an angel of death - dogs, foul music... you name it..! Every time, crushing disappointment .... and with the knowledge that I must work like a dog for another year before the next chance will arise. It is impossible to think properly in people-dominated spaces. I must be immersed in nature - not in an idealised, "pastoral" nostalgia - rather, simply being absorbed and integrated into the real forces that drive the world - most of all to become "insignificant" among them. I will be having a great deal more to say about this man in the coming years. Particularly on the subject of commissions. 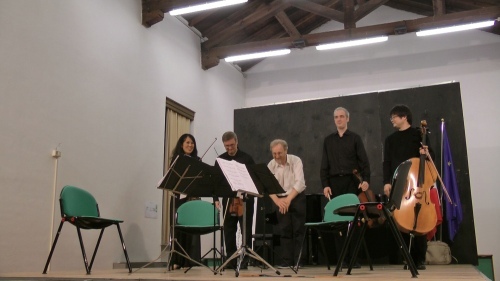 Borealis Quartet performed my "accept these few roses" at Casalmaggiore International Music Festival in Italy. New friends! Some kind words in the catalogue of this leading American distributor.